On this day in 399 BC, Socrates was sentenced to death in Athens. The Ancient Greek philosopher was executed for the difficult-to-define crimes of “refusing to recognise the gods recognised by the state,” “introducing new deities” and “corrupting the youth.”His trial took place publicly in central Athens, in front of three accusers, a jury of 500 men and a vast crowd of spectators. For three hours the accusers stated the case against him, and for three hours afterwards Socrates stated the case for his defence. At the end, every juror was asked to place a small token into one of two urns: one marked “guilty,” one marked “not guilty.” The jury, known as a council of 500, found the 70-year-old to be guilty by a margin of 280 to 220. Following the verdict, the jurors were asked to decide upon the suitable punishment. 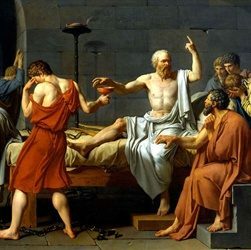 Socrates’ accusers argued in favour of the death penalty, while Socrates argued—with ill-judged sarcasm—that he should be rewarded for his actions. After some reflection, he instead suggested a small fine. Had he suggested exile from Athens, his life would probably have been spared; but instead the jurors were forced to choose between execution and an insignificant fine, and they chose execution. The actual reasons for Socrates’ prosecution and subsequent execution are a little unclear—and the charges very vague—but it is unlikely to have anything to do with religion, as claimed. Rather, the philosopher and his anti-democratic teachings were seen as a threat to the Athenian rulers. The city-state had just emerged from a period of great instability, in which a rebel organisation called the Thirty Tyrants had overthrown the democratic government and instituted a brutal reign of terror, banishing and executing thousands of innocent citizens and attempting to impose oligarchic rule. The leader of the Thirty Tyrants, Critias, was one of Socrates’s pupils, and this connection quite probably condemned the teacher to death. Photo Caption: “The Death of Socrates” by Jacques-Louis David, 1787.